Time and again I’ve referred to Lutfur as Our Dear Leader as his is plastered over dustbin lorries and lampposts, but now he seems to have excelled in his totalitarian desires. For we are now in the Olympic golden age of Lutfur the Barbarian. 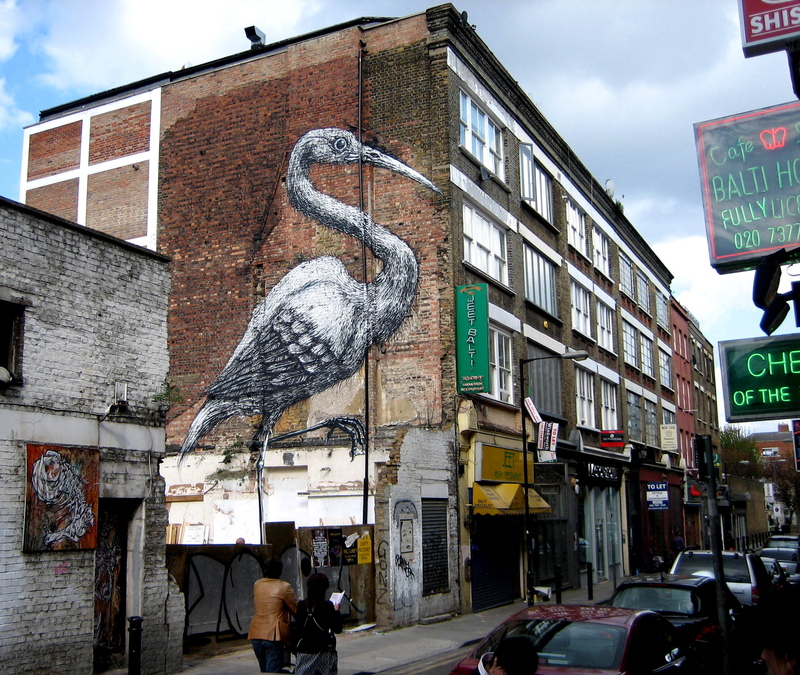 You can read about Roa’s crane here on Tower Hamlets’ best blog, Spitalfields Life. Roa’s fine draftsmanship sets him above other street artists and I particularly admire the vivid sense of life that he imparts to his creatures, which transfix you with their wide eyes. Yes, that almost imperial banner contains a photo of the Great Man. 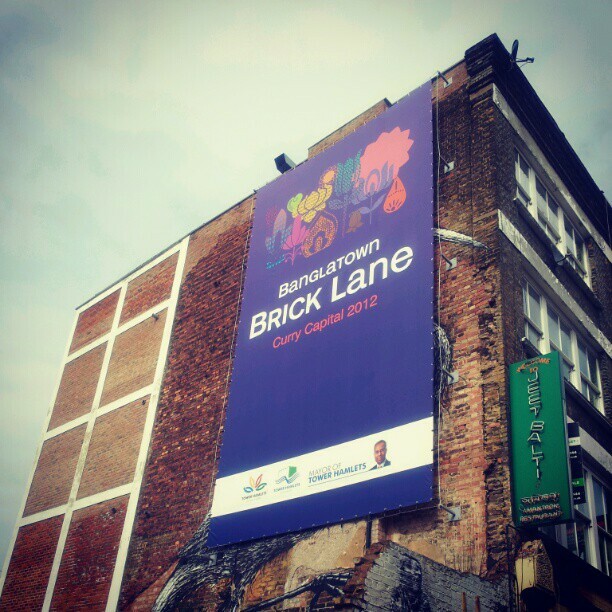 It is a picture of him advertising that simply stunning deal he negotiated with Seb Coe last year when he agreed to give up the Olympic marathon route going through our dirty little borough in return for…..Brick Lane being named Curry Capital 2012! Surely this kind of vandalism needs planning permission? Yes! It’s here. And look whose name it is under: see the application here. Yes, my mate Takki Sulaiman (to be fair, he is only following orders you know), the council’s head of communications. Take an even closer look at that application form at Question 5: “Have you consulted your neighbours or the local community about the proposal?” His answer: No. The date of the application was May 16. There was a question posed by a Tory councillor on the papers for Wednesday’s infamous council meeting asking why land searches were taking so long in the borough. So unless the council has promoted its land search to the top of the pile, we can safely assume permission has not been granted. Yet it is up there. Over the sacred Bengali bird, the crane. I suspect the gods of culture will be willing someone to tear it down. There’s a petition here. It already has more than 300 signatures.